Haskell, C.A. 2017. From salmon to shad: Shifting sources of marine-derived nutrients in the Columbia River Basin. Ecol. Freshwater Fish 27(1): 310-322. DOI: 10.1111/eff.12348. Haskell, Craig A.; Beauchamp, David A.; Bollens, Stephen M.
Haskell, C.A., D.A. Beauchamp, and S.M. Bollens. 2017. Linking functional response and bioenergetics to estimate juvenile salmon growth in a reservoir food web. PloS ONE 12(10): e0185933. Haskell, C.A., D.A. Beauchamp, and S.M. Bollens. 2017. Trophic interactions and consumption rates of subyearling Chinook Salmon and nonnative juvenile American Shad in Columbia River reservoirs. Trans. Am. Fish. Soc. 146(2): 291-298. 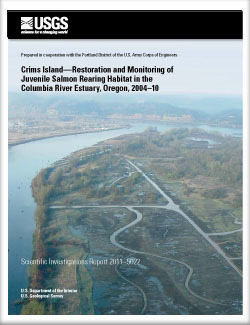 Haskell, Craig A.; Tiffan, Kenneth F.; Rondorf, Dennis W.
Tiffan, Kenneth F.; Connor, William P.; Buchanan, Rebecca A.; St John, Scott J.; Erhardt, John M.; Haskell, Craig A.
Haskell, Craig A.; Tiffan, Kenneth F.
Crims Island-Restoration and monitoring of juvenile salmon rearing habitat in the Columbia River Estuary, Oregon, 2004-10; 2011; SIR; 2011-5022; Haskell, Craig A.; Tiffan, Kenneth F.
Haskell, Craig A.; Tiffan, Kenneth F.; Koch, Ryan C.; Rondorf, Dennis W.
Haskell, Craig A.; Baxter, Rex D.; Tiffan, Kenneth F.